A new Maritime Innovation Challenge to foster international research collaboration between international naval and maritime primes and an Australian university has been unveiled at the Pacific 2017 International Maritime Exposition in Sydney. Fincantieri, CETENA (owned by the Fincantieri Group) and Flinders University have teamed up to deliver the Fincantieri-Flinders-CETENA Maritime Innovation Challenge that will see Fincantieri and its research subsidiary CETENA fund and support proposals submitted by Flinders University researchers in the area of maritime research. The initiative is based on a simiar challenge funded by Fincantieri in Italy, where the company has been promoting a series of activities in the field of open innovation, a model of collaboration between companies and research facilities that emerged in recent years, especially in areas with the highest rates of innovation, such as ICT and biotech, and in the most advanced countries in terms of technology. The initiative will also see Flinders University researchers collaborate with their counterparts from the University of Genoa, which signed a memorandum of understanding with Flinders earlier this year, with the aim of supporting and selecting innovative technology projects to be industrialised. Flinders University and Fincantieri have previously collaborated, with Flinders students undertaking internships with Fincantieri in Italy. Fincantieri Australia chairman Dario Deste said the global shipbuilder is excited by the prospect of Flinders’ leading researchers applying their knowledge to research that addresses the needs of the maritime sector. "The fast pace of technological and socio-economic change means we need to think cleverly about how we develop maritime capacity – addressing the challenges of the future requires focused research and hard evidence," Deste said. 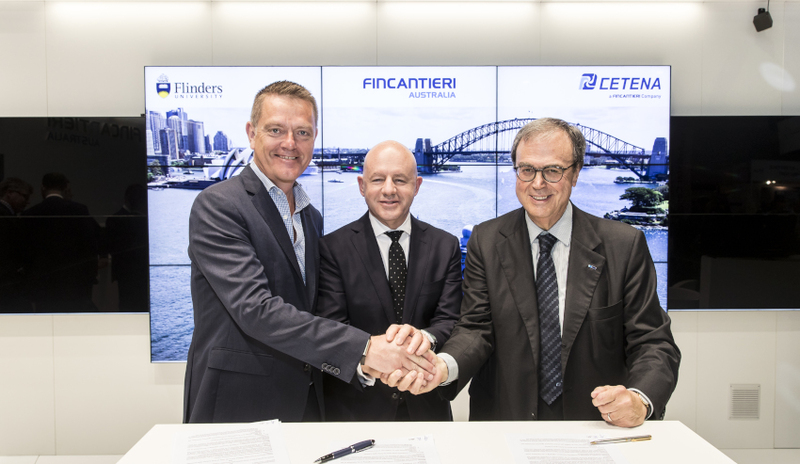 "Fincantieri is committed to supporting Australian innovation, and our burgeoning relationship with Flinders and its exceptional researchers exemplifies that commitment." Flinders University vice-chancellor Professor Colin Stirling added the initiative provides an opportunity for Flinders to showcase its leading defence research on the international stage. “We’re delighted to be growing our relationship with Fincantieri in a meaningful way that will make a positive difference to an accelerating global industry. This initiative lays down the challenge to our researchers to think outside the box to find innovative solutions to real world maritime needs," Professor Stirling said. "An example of this thinking is Flinders research that harnessed fibre optics used in gastrointestinal medicine to address pressure and noise challenges in submarines. We thank Fincantieri and CETENA for their investment in innovative research, and the enormous potential it presents." President and chief executive of CETENA Sandro Scarrone was also present for the signing of the agreement. CETENA will work collaboratively with Flinders University and University of Genoa researchers on the Maritime Innovation Challenge. “CETENA has a long history of working with leading Italian research institutions such as the University of Genoa. We are thrilled to be bringing this collaboration to Australia and look forward to working with Flinders University,” Scarrone said. The Maritime Innovation Challenge will open for submissions this month, with project proposals to be reviewed by December 2017. Fincantieri is one of three shipbuilders short-listed by the Australian government to participate in the competitive evaluation process for the Future Frigates SEA 5000 program, which will see the successful bidder design and construct nine frigates for the Royal Australian Navy.